Michael Arlt pays hommage to the classic jazz organ combo with this new release from Organic Music, thus entering his name in a long list of organic-compatible guitarists that began with Bill Jennings and Floyd Smith and moved through such greats as Thornell Schwartz, Grant Green, Eddie McFadden, Kenny Burrell, Wes Montgomery, George Benson and Pat Martino, just to name a few. As you listen to this music, you will hear how he has captured the essence of this jazz style through it's many players and how his efforts make a formidable contribution to the continuum. Michael Arlt was born in Westfalen, Germany in 1960 and began playing guitar as a teenager. From the beginning, he was interested in a musical gamut, playing in rock, blues, fusion and 'free' bands. He came to Boston in the mid-eighties to study at Berklee College of Music, took private lessons from Mike Metheny and continued his studies in the Netherlands at the Amterdam Academy of Arts under Wim Overgaauw. Since that time, Michael Arlt has appeared in a variety of ensembles with musicians like Maria de Fatima, Jerry Granelly, Sigi Busch, Rick Hollander, Leszek Zadlo, Wolfgang Ekholt and Joris Tepe and has recorded with Roman Schwaller, Houston Person and Red Holloway (organic music 9701 and jhm records 3607). Currently, he teaches guitar at the Hermam-Zilcher Conservatory in Wurzburg and continues to perform and record with the group 'Grooveyard'. 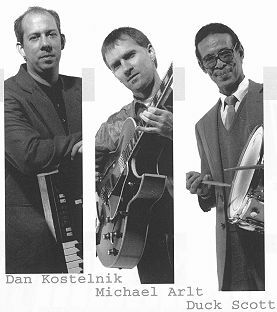 For this session the guitarist has assembled a trio he calls 'We Three', comprised of organist Dan Kostelnik and drummer Duck Scott. Wisely, the important tenor voice of Roman Schwaller was added on three tunes, enabling Michael to mix his American and European influences for a fresh, exciting approach to the music. It was August of 1995, when Michael stopped by the infamous 'Ortlieb's Jazz Haus' in Philadelphia to hear and meet Billy James, who was playing in Bootsy Barnes' trio. In this den of soul music, patrons can hear the 'players of old' grooving with the young lions of today... each eager to maintain or carry on the tradition of organ-based jazz. The young lion that night was Dan Kostelnik who was sharpening his aim on the Hammond organ. Dan has an impressive resume on both classical and jazz piano and studied jazz performance while at William Paterson College. He, too, has made the switch to the organ like so many other young pianists and embodies the true traditions of jazz organ. Michael heard in Dan a compatible sound to his own and later discussed with him the possibilities of getting together. Fortunately, Dan was interested and even shared with Michael a musical sympatico he had developed with drummer Duck Scott... thus providing a vital component to their emerging organ combo. Duck is the son of pianist/organist Shirley Scott and needless to say, has been influenced by the world's greatest players of the art form. He studied under "Philly" Joe Jones and Bobby Durham and knows the strategies of dumming behind the organ with its integrated bass lines. The list of organists with whom Duck has worked encompasses virtually all the greats and a more knowledgeable drummer for this trio would be hard-pressed to find. The trio opens up this date with a relaxed rendition of one of Michael's favorite Pop tunes. "Isn't She Lovely" moves progressively deeper into the groove as it gently rocks you with its light shuffle and spacious lines. Throughout the session, Dan reveals his ability to handle changes smoothly as in "My Girl Is Just Enough For Me". Here the trio shows how nicely it can move through heads and bridges over Duck's wide repertoire of rhythms. Half of the ten selections on this date are penned by Michael himself. The first original is an up tempo samba he calls "The Triangle". Duck's drums sparkle as the guitar calls out a clever melody followed by crisp, clean lines that Dan emulates, making this an equal effort by all. In contrast "Here There and Everywhere" offers an easy, slower tempo that allows this Lennon/McCartney classic to climb into your mind and elicit warm thoughts. Dan uses dynamics to his advantage as sounds cascade down to Michael's deliberately played but delicately chosen notes. Another Arlt original surfaces in "Basic Instinct". This is our first chance to hear Roman Schwaller's tenor interact with the trio as Dan plays a head that each player contributes to. The groove is right out of the great soul jazz bag of the seventies and we hear a nod to Grant Green and others who created that sound. As anticipated, Roman's strong voice pushes everyone on, showing that there is nothing bashful about his playing. Your head should keep nodding as you hear 'Soul Mates' with its memorable lines and great guitar energy. 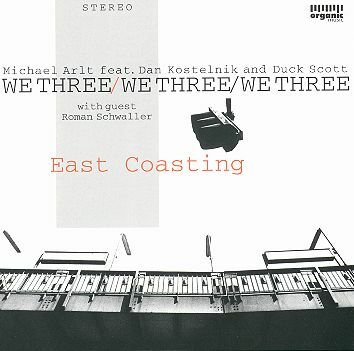 With the title track "East Coasting", Michael takes close aim at worldwide market appeal with great comping and Benson-like lines. This tune will get lots of airplay on my radio show for sure! The feel is a bluesy romp that conjures up R & B classics, the progressions are cool and breezy as Duck plays all of his drums and Dan locks into the groove nicely. Schwaller returns with authority in "You Say You Care", attacking his reed and boldly playing his entire instrument. The group does extremely well listening to one another and integrating the sounds which are held together tightly by the drums. Michael's lines are articulate, fast and fun to follow. A darker yet intriguing mood is juxtaposed to this in "Estate", which has the organ introduce us to the melody held up by a Bossa Nova rhythm. The guitarist is never over-powering as he releases a thoughtful barrage of notes, expanding the already exotic mood. The blend of organ, guitar and drums is very hard to resist in this classic interpretation. Web pages created by Gilles Bacon � 1997.